[woof_products per_page=8 is_ajax=1 tpl_index=tpl_2 taxonomies=product_cat:100,taxonomy=pa_color] I am doing something wrong, i want to show only products from categorie 100 and with taxanomie pa_color? [woof_products per_page=8 is_ajax=1 tpl_index=tpl_2 taxonomies=product_cat:100+pa_color:X ] X is id of the pa_color term. I have installed it on tested server and its causing the issue. Will you plz check this ? Hi, I have sent message with login detail. Plz check. I did not receive an email from your account. Hi, Sent message again on contact form. Plz check. Is there any way to create separate shortcode for individual category with product filter? If yes then how? But there should be only one filter on one page. We want filter in pages. 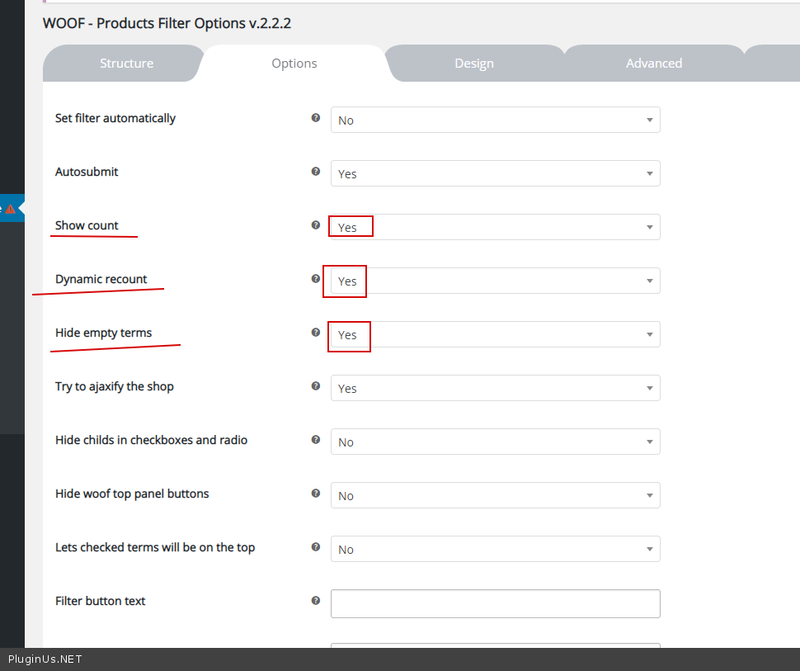 So we want that cat1(with all sub category) is showing in filter with page 1 and cat2 is only showing in filter with page 2. So no cat 1 is showing in page 2 and cat 2 is showing in page 1. Still we can got cat 1 and cat 2 are showing in both filter. Is it possible to display single individual category in widget? Ex. Shortcode should display only 1 category and another shortcode should display only another 1 category. Sorry, but its working only hidden_terms ids. Are these two screenshot possible using below screenshot? Can you know me how? This code is already exist? 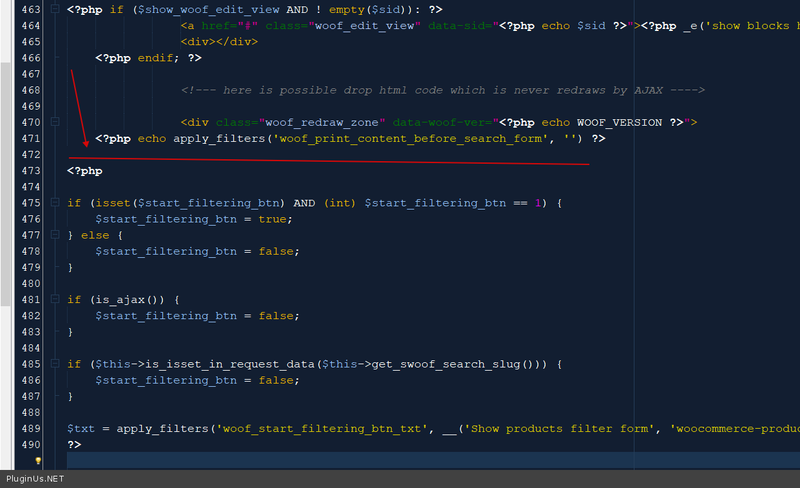 How can i removed unwanted category id from shortcode like [woof sid=”auto_shortcode” autohide=0 taxonomies=product_cat:31]??? Drop me exact link to the issue. Looks like you customized the plugin code. Is it possible to remove Uncategorized from the categories options? Presales: Would it possible to create something similar to this https://pasteboard.co/I3en12k.png using your plugin? - Can i define dropdowns and checkboxes? Really liking this plugin. I have one quick question please. Is it possible to have the filter section initially visible if views on a desktop/tablet viewpoint but initially closed in viewed on a mobile? Maybe have a text option/toggle to say close or open depending if is open or closed? Using Autohide means the text/button/icon to show and hide the filter panel is not shown. What I am after is that the text/button/icon is always there. I just want the panel open on desktop and hidden on the mobile but you can still toggle the panel open/close on both. Hello, I’m currently using the plugin on a site successfully, but I can’t get the plugin to work on a subdomain I created for the main site. The subdomain WooCommerce and WOOF settings are set to be exactly the same as the main page that I’ve previously created… but in the subdomain, my WOOF filter widget is empty, and all I’m able to see is the title and the reset button — no checkboxes or categories and other filters. Thank you for the support, I submitted the requested info via the link above. Looking forward to the help resolving this. I checked it, and everything works great…I appreciate your support! I currently have the paid version on my main site, and will certainly do so for this subdomain as I’ll be expanding in the future. Thanks again for the help. Great plugin, with amazing support! Hi, is it possible with this plugin to open the shop page with a filter already applied? For instance to show by default a certain category? And have other preconfigured filters applied by just clicking on a button? Just one pre-sale question. Is it possible to display different filters on different categories? There is difference between headphones and laptops…like on some ordinary shop. Thanks. We did not do a special test. But I think it should work well. Hi, this is nice plugin indeed. Your trial version rocks, because now I can see it’s really worth it. I am thinking however about one thing. I want to show to my users, who want to use the filter, custom text or as I call it – some kind of notice. It would be very helpful if this plugin knew this already, or am I missing something? Thank you. Please describe in more detail what you want. You can use screenshots. Hi, I would like to customize the query of the products on category pages. If I’m viewing from a “engagement rings” category, I would like to exclude a term(“wedding rings”) using “NOT IN” operator so that wedding rings product will not show on that category page dynamically and also on the search. How can I do that? I’m trying the hooks but it seems complicated and limited with relations. Use hooks – this is the best way to change requests. 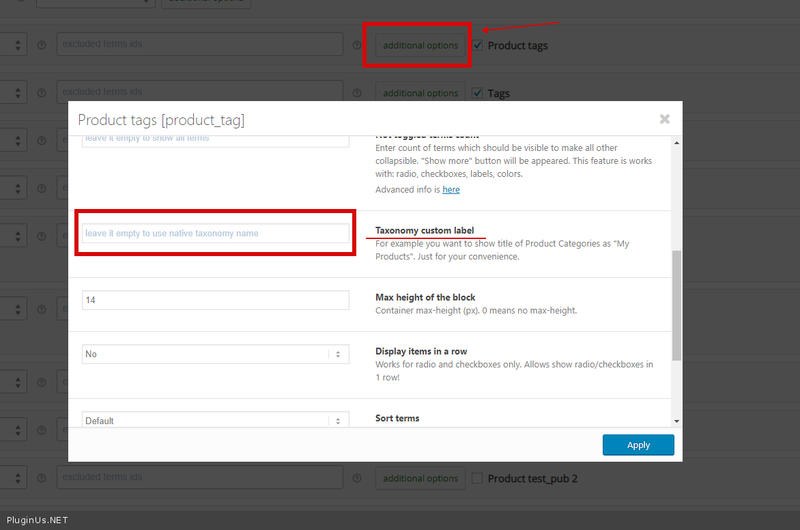 Is there a way that we can exclude automatically the terms that are not related to that product category page? I see that the default is showing all terms as options although it’s not related to the category page. I have already tried that but I still can’t achieve the filter option count based on the products that have been queried. 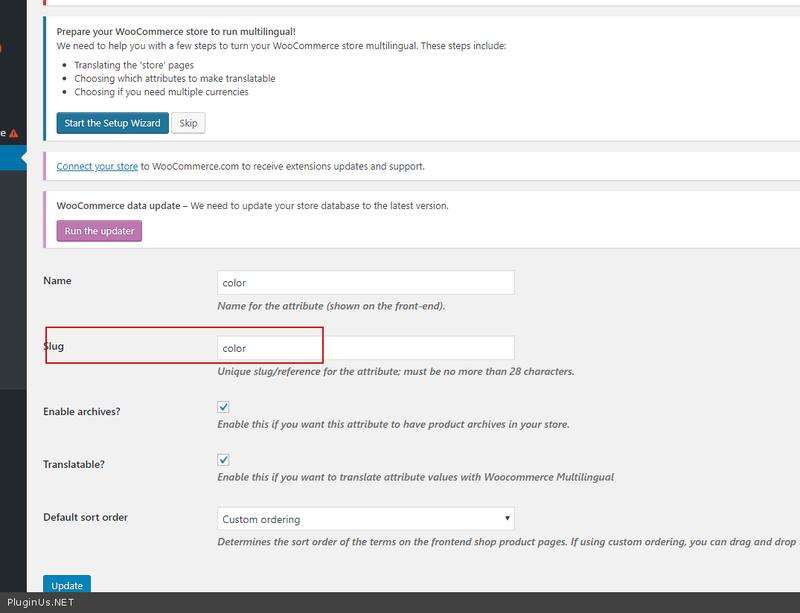 Is there a way to make the filter get the options based on the number product from my pre_get_post(woocommerce_product_query) instead of getting all the count from the categories itself? Hi! Thanks for this. It seems that the query did not include my pre_get_post due to caching. I have fixed it now. Lastly, I would like to ask if there’s a way to have a price sort with highest and lowest options. How do I achieve that? Thanks! I want to have like a dropdown text with “lowest” and “highest” options without putting any number value. As simple as that. This filter does not affect the sorting of products. Is there a way to add a sorting filter?? You need code customization. Unfortunately we do not have a ready solution. But how do I enable this ordering options http://prntscr.com/mwnmqe using the woof widget? I can’t seem to enable it on the settings of the plugin. Hello, I’m using the free version of the plugin and I like it very much. I’d like to buy the full version and I have two questions: 1. I have created a working filter now using the free version – if I buy the full version, will I lose the settings done via the free version? Should I install the full version as a new plugin or just enter an activation code to continue using the free version with extended functionality? In other words – how the transition between the free and the full version will be implemented and will I lose my settings? 2. In plugin Options, I see “Hide empty terms” – a full version option. I need to hide the attributes (color, size) that are not available for the selected products. I believe this is the option I need, right? But I don’t want to display the number of items near the taxonomies terms. Will “Hide empty terms” work if “Show count” and “Dynamic recount” are set to NO? Hi, I’m having a problem with the logic of filtering. In my configuration, I’ve selected the option “OR”. I assume that option “OR” means that if I select two terms in the filter, any product fulfilling any of those conditions should appear. For example, in a shoe shop, if I select size 35 OR 36 (and In Stock), I should get all the shoes that are available in sizes 35 OR 36. My problem is that I get only those shoes that are available in 35 AND 36 size. Meaning that, even if I configure the plugin with OR, the system shows the result with AND. Can you help me with this? Thanks a lot! This is a little more difficult for variable products. filter looking for variations that have "outofstock"  If this variation exists, remove the parent product. I’m sorry but I do not understand your reply. Do you mean that it does not work properly in my case? Yes, unfortunately it will not work in your case. Hello! We are using the newest version of the plugin and woocommerce. There is a problem where we filter the results and click on page 2 – it throws ERR_TOO_MANY_REDIRECTS error. Here is the link: https://piedo.bg/produkt-kategoriya/%D0%B6%D0%B5%D0%BD%D0%B8/%D0%BE%D0%B1%D1%83%D0%B2%D0%BA%D0%B8-%D0%B6%D0%B5%D0%BD%D0%B8/page/2/?filter=1&pa_%D0%B6%D0%B5%D0%BD%D0%B8-%D0%BC%D0%B0%D1%80%D0%BA%D0%B0=apex&really_curr_tax=14-product_cat . I believe the problem is with product attribute slug, which is non-latin. But there is over 1000 products in the db. Can you help me? Thanks in advance! I believe the problem is with product attribute slug, which is non-latin. – Yes. And it does not depend on this plugin. If you disable this plugin, the result will be the same. 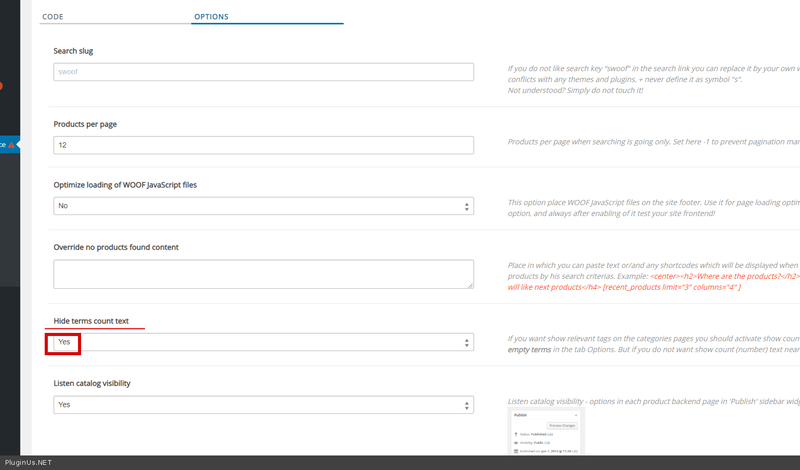 Hi there, I have installed the free version on my website and can only filter the products if a am on domain.com page. If I enter the domain.com/shop or any other page the filter does not work any more. The widet is there, I can pick dhe filter item, it starts loading but does filter anything. Can it be some server setting causing it. Looking forward to your reply. When using Disable swoof influence the categories in the filter don’t show they have been selected. Is there a fix for this? Please drop me exact link to the issue. I have just submitted a support request and included the link. One thing I just noticed, if you filter by an attribute first, then a category, the category is shown checked correctly. Did you receive my support request that contained the link? I decided to turn off disable swoof influence, it’s not ideal as the header changes to the shop page, but at least the filters work.